Did you know they did surgery on a grape? As all memes do, this one thrives when you blend in humor and absurdity — and it’s the perfect time for it, too. It’s that weird time of the year when it’s already winter, it gets dark at 4, but it’s not really Christmas yet, so we can all warm ourselves with some quality memes; but where is this one coming from? Well, you might be surprised to learn that they actually did surgery on a grape. In 2010, doctors from the US state of Illinois successfully used a surgical machine to peel a grape’s skin off, making a video to show it off. In 2014, they made another video where they were also stitched the grape’s skin back together. Earlier this year, the Peter MacCallum Cancer Centre in Australia released a similar video. The robots can be put to great use for human surgery, particularly when it comes to removing cancerous tumors — but as it so often happens on the internet, nihilistic humor found a way to creep in. After all, as the saying goes, when life gives you surgically-altered grapes — make memes. Through all its absurdity, the meme also says a lot about human nature — we’re capable of inventing this amazingly complex machine that can save many lives, and demonstrate it on something as fragile as grape skin. But then again, the idea of grape surgery just cracks people up. The meme found a home with its peers. 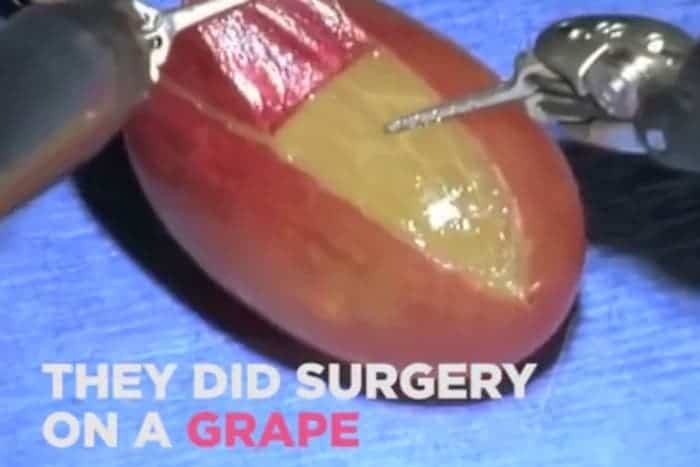 Different variations started emerging, although the meme is essentially just saying “they did surgery on a grape” in different ways. If you’ve made it this far and still have no idea what this is about — join us! It’s so silly I also feel I don’t even understand why it’s funny. But in an internet-meme kind of way, it’s actually pretty good. By the way, did you know they did surgery on a grape?